In some ways, the world has always been a smaller place than we generally realize. Different cultures have exchanged ideas across vast spaces since the beginning of recorded history. HoMA’s recent exhibition, Art in a Time of Chaos: Masterworks from Six Dynasties China, 3rd–6th Centuries, was a great example of this, and included not only artworks demonstrating the spread of Buddhism across the Asian continent, but also recent archeological finds that have revolutionized our understanding of the influence of Persia and other Western and Central Asian cultures on China 1,500 years ago. In contemporary art, the merging of ideas from not only diverse places and their cultures, but also disparate time periods, sometimes achieves remarkably subtle and nuanced results. The museum’s current exhibition Yun-Fei Ji: The Intimate Universe is fascinating in this regard. The artist is firmly rooted in the techniques and formats of classical Chinese painting, going back over a thousand years to the Song dynasty (960–1279). 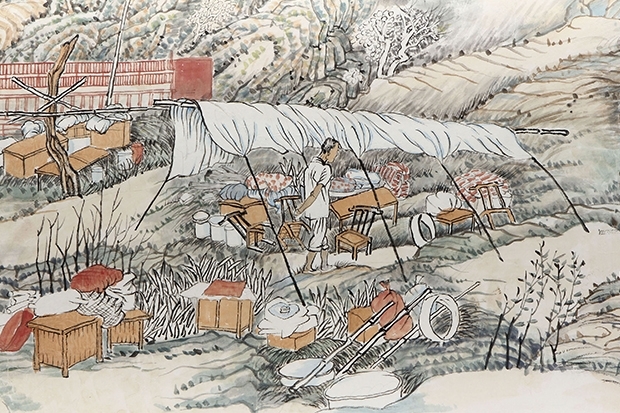 To adapt the traditional handscroll format to narratives on contemporary society is in itself a radical innovation, but subtle details in Yun-Fei Ji’s works take the concept of cross-cultural influence to truly surprising degrees. For me, this is nowhere more evident than in the artist’s study (of all things!) of early Italian Renaissance frescoes. As Tracy Adler pointed out in her excellent essay for the exhibition catalogue (available in our Museum Shop), Yun-Fei Ji was a recipient of the Rome Prize, and lived in Italy from 2005 to 2006. During this time, he was exposed to the works of Giotto (1266/7–1337), in particular the Scrovegni Chapel (also known as the Arena Chapel) in Padua. Giotto’s best preserved accomplishment, the Scrovegni Chapel was completed around 1305, just a few decades after the fall of the Song dynasty (remember that Song paintings are also foundational to Yun-fei Ji’s style) on the other side of Eurasia. As a revolution was happening in Chinese painting, so was a revolution happening in Italian art at the time, centered on Giotto and his break with the Italian Byzantine tradition evident in his recent predecessors such as Cimabue (1240–1302). While virtually every aspect of Giotto’s painting was revolutionary, what is key for our purposes here is that he broke with the standard three-quarter view pose of Byzantine icons, and his figures take every imaginable pose, from full profile to even having their backs to the viewer. When I first saw Yun-Fei Ji’s paintings, I noticed in particular his figures, about which there is something slightly unsettling from the stance of traditional Chinese painting (during the exhibition, many visitors have made similar comments to me). Once you realize that he is drawing his inspiration from Giotto, though, they make perfect sense. In fact, Yun-Fei Ji’s interest in Giotto’s frescoes itself makes perfect sense from the perspective of traditional Chinese painting. Much like Yun-Fei’s favored handscroll format, the Scrovegni Chapel frescoes convey a series of progressive narrative images in long horizontal bands (in Giotto’s case, spread across multiple levels), something that had already characterized Chinese narrative painting in Buddhist murals for centuries before the Song period. Also, while the idea of showing a figure with his/her back to the viewer was radical in the context of the Italian Renaissance, it was not unheard of in Chinese Buddhist narrative art either. Which, in a roundabout way, brings our discussion full circle. The beginnings of Buddhist narrative art in China survive mostly from murals decorating cave chapels from the Six Dynasties period in such places as Dunhuang, which are in turn part of a larger (broadly speaking) tradition of cave chapels spreading from China in the east to Byzantine Asia Minor in the West. On the one hand, cave chapels in China set the precedent for the classical East Asian painting transformed in Yun-fei Ji’s work, while on the other hand, the cave chapels in Asia Minor set the precedent for the Byzantine tradition transformed by Giotto, which in turn became a second source of inspiration for the paintings in The Intimate Universe. Small world, indeed!